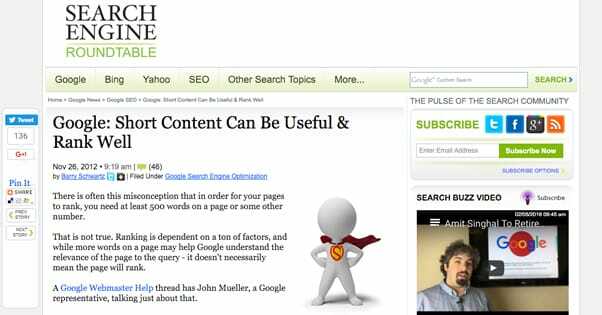 Blog > Content Marketing > Can Short Articles Rank Well on Google? About six years ago, before Google Panda, the world was filled with millions upon millions of tiny, low-value articles that has virtually nothing of use in them. You would see dozens of blogs in the top 100 Google results, all of which had 1-2 paragraph pages that couldn’t answer a question well to save their lives. High quality sites provided lengthier posts with more value, but they didn’t necessarily always rank that well. 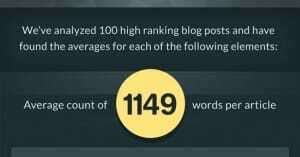 A site with 10 lengthy, valuable posts would rank, but if another site came along with 500 short, keyword-optimized posts came along, the sheer mass of ranking pages would push it over the more valuable result. Google, obviously, didn’t want this to be the way of the world. They were worried; people were unsatisfied with their search results. They needed something that would demolish all of those tiny low-value blogs and promote the ones users actually wanted; the ones with plenty of value, and with it, plenty of length. What they came up with, as I spoiled in the first sentence, was Google Panda. It shook up blogging as an industry and SEO as a whole, and the Internet hasn’t been the same since. Panda struck first in February of 2011, and according to Google, it affected as many as 12% of all search results, which is a huge number. It’s primary purpose was to hurt sites publishing thin content, content farms, sites with excessive ads, and some other quality issues. In the five years since, Panda has been updated dozens of times, and it was eventually rolled into the core algorithm instead of being its own thing. You can see a history of Google’s algorithm changes, as tracked by Moz, here. Look again at the things Panda hits. The most important one is “thin content.” What does Google consider thin content? That’s a very tricky question, and it’s one even Google hasn’t fully answered. Word count alone doesn’t do it. There are some popular bloggers who post anywhere from 50-800 words and their posts rank just fine. There are others that post 5,000-word diatribes that go unranked because they’re near-incomprehensible. There’s more to the thinness or thickness of content than word count. There’s a certain amount of semantic indexing going on to determine what topics the content covers and how deeply it covers them. Back in 2011, this was a very unsophisticated algorithm, but it has grown and gotten more detail-oriented over the last several years. If you’ve seen Google’s search guidelines, you know they have a lot of different criteria, ranging from the perceived authority of the site to the quality of the prose. Even typos can hurt ranking. 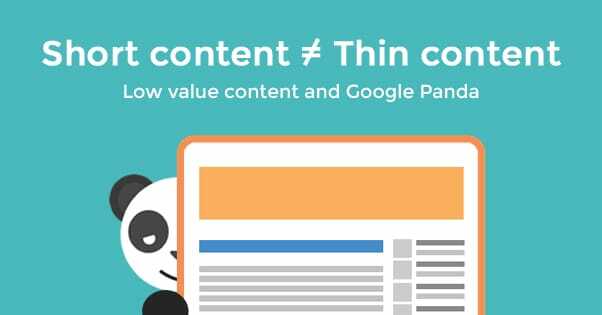 Panda, and thus Google, hates thin content. The trouble is, thin content isn’t well defined. 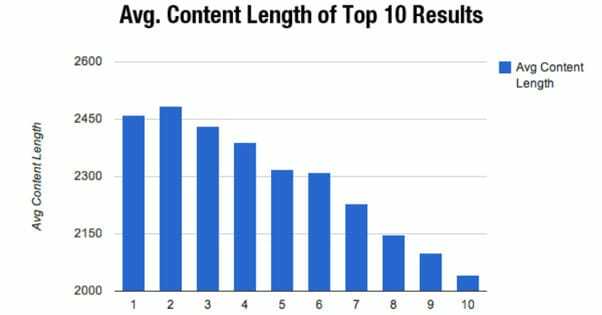 Because it isn’t necessarily correlated to the length of the content, then a simple answer is yes; short content can in fact rank well. Realistically, though, you have to ask yourself if short content can pack enough value in to be considered not thin. In most cases, there’s no reason not to add more to make it a lengthier, more robust article, which is likely to rank better and last longer. After the initial set of Panda updates, SEO had adapted into the more content-focused approach we’re used to today. The trouble is, many webmasters were still thinking in the black and white, mechanical way they were used to. It used to be easy to rank a site; pick a keyword that fit certain criteria, write X number of pages and post them, link to them from a specific list of sites, and bam; rank 1. Google’s new content-focused approach was more semantic, less algorithmic, and thus harder to game. One of the big questions people asked was “how long does content have to be to rank now?” It was a valid question, in a world where it looked like everything under 1,000 words was nuked from the search results, and the word count threshold seemed to be increasing by the week. In other words, short articles are fine, but longer articles tend to have more value because they have more space for more value. There’s no real benefit to keeping an article short; a lengthier post on the same topic can rank even better. Google encourages allowing discussion on short articles, to further boost the amount of content on the page and making it more likely to rank higher. There’s no magic word count you should reach according to Google, and that’s a very calculated statement. They don’t want to say “minimum 1,500 words” and find webmasters pumping out post after post that cuts off at 1,501 words just to get as many pages to rank as possible. Google wants you to focus on more than just length; they want value, information, and quality as well. So that’s all well and good for a few years ago, but we all know SEO changes very quickly. What was acceptable a few years ago could very well get you penalized today. So where do things stand now? Neil Patel (of course Neil Patel) has the answer with a pretty detailed study of the data. When I mentioned above about certain well-known bloggers publishing short posts and still ranking, this is what I mean. Seth Godin posts whatever comes to his mind, and the weight of his site as a whole carries it. He has a 66-word blog post as referenced by Neil, and that ranks just fine. Does that work for everyone? No, of course not. 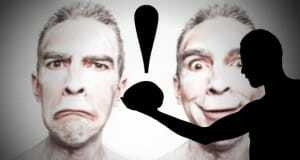 You and I, we’re not Seth Godin. We won’t be able to get away with posting something that short. Only the top of the industry, the masters, the people who are basically household names can get away with that kind of thing. Of course, the opposite is also true, in terms of post length. These days, the general impression is that a longer post is a better post, but that ignores quality. There are plenty of 2,000, 3,000, 4,000-word or longer posts out there, all completely worthless to virtually everyone. Substance. This is the essence of the post, what you’re trying to say and how long it takes to say it. If your topic can be answered in a simple short explanation, it may be wise to avoid fluffing it up to 3,000 words. On the other hand, if your topic is lengthy and requires plenty of space to do it justice, then by all means, don’t skimp. Style. Some writers naturally work with a shorter style, while others go on and on. It’s the difference between the famous Hemingway six-word story and, well, any of these. Frequency. If you’re posting every day, shorter articles work. If you’re posting once every two weeks, you want to make those posts worth every second of preparation. Format. Sometimes formatting – lists, subheadings, infographics – make a post feel longer than it is. A stretched out post might benefit from being shorter so users don’t lose interest halfway down. Purpose. Blogging is just one purpose for a content page, and it tends to benefit from length. 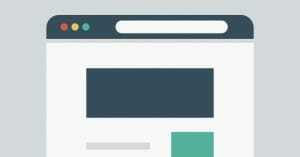 Other types of pages, like a homepage or a landing page, likely benefit from being shorter and more concise. Audience. At the end of the day, whatever provides the best value to your readers is what you should do. Google will take notice of metrics like your click rates and bounce rates, and will promote you for the beneficial metrics that come with pleasing your audience. Neil also includes medium, such as infographics, landing pages, and ebooks in addition to blog posts. I’m largely ignoring this simply because I’m primarily discussing blog posts. Obviously, tailoring your content to the purpose and medium is expected. As for the data? SerpIQ found that on average, posts in the top 6 spots in Google rankings were above 2,300 words. Posts in the 1-3 spots were 2,400-2,500 words, generally. As usual when you’re studying data like this, remember; this is a correlation, not a causation. High quality content tends to be around 2,500 words, and high quality content is ranked well. That does not mean that you rank well for reaching 2,500 words; it just means that ranking well is a feature of many posts that range in that word count. There are a lot of different factors that can help you determine what kind of length you need to shoot for when you’re writing a post. Start off with the kind of blogger you are and the kind of blog you run. Do you like to dig into analysis, like a political blogger or something like Five Thirty Eight, that looks into statistics quite deeply? Do you like to write extended guides for the evergreen value, or long, detailed ebook-style posts? If so, you’re going to want to tend towards the lengthier end of the spectrum, from 2,000 words and up. On the other hand, what if you’re a travel writer, or a fitness writer, or something who likes to cover news or celebrity gossip? There are entire sites that thrive on ultra-short articles. When was the last time you counted the words on a page on Upworthy or Buzzfeed, for example? Figuring out the theme and format of your post will help a lot as well. Are you covering a topic on a superficial level, answering a simple question? Are you creating a beginner’s guide that doesn’t need to get into technical language or the reasoning behind a process? Those can be shorter posts. Are you digging deeper or writing for advanced users? You might want to provide more information. Another thing you want to watch out for is fluff. Fluff language is writing that doesn’t need to be a part of the content. A lot of times, when you encounter a 3,000-word post that doesn’t rank well, you’re probably looking at a very fluffy post. When you cut out the sentences that don’t matter, the irrelevant details, the overly long introductions, and all the rest, you end up with a much shorter post. This is actually worse than just having a shorter post. Why? It says to Google that you care more about word count than value. You’re trying to hit the magical 2,000-word mark even though your topic is only worth 300 words. 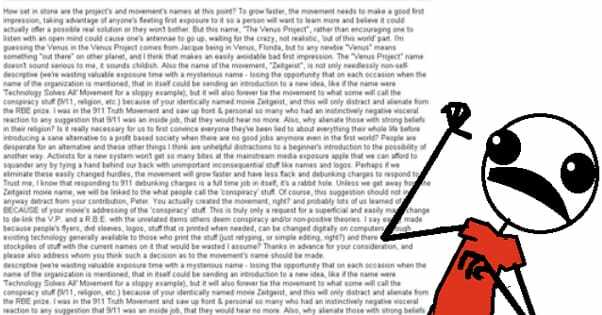 If you have a shorter post and you want to make it longer, by all means, do so. Just don’t do it the way a high schooler does to make their essay word counts; that is, by writing the same paragraph twice with different wording, or doing the “tell them what you’re going to tell them, then tell them, then tell them what you told them” format of fluff. On the other hand, you can always try to trim down a longer post into component parts to make it shorter. If your site tends to publish posts in the 1,500-word range but you wrote one that’s 3,000, you can try to either divide it into two post or trim 50% of the word count away. Depending on what you consider crucial, you may be able to be ruthless enough to do it. To create a winning post that’s sure to rank well – though not necessarily #1 in a SERPS page – you need to start with a strong foundation. Do your research and look for a topic within your niche and industry that people care about. Answer a question, provide a guide, look into statistics; it doesn’t matter what, so long as it’s valuable. When you have that value, do a few searches to find out what your competition is. If you’re lucky, there won’t be any, but that’s growing increasingly rare as time passes. Study the existing competition and boil their posts down to component parts. What data sources are they using? What perspectives are they taking? What are their conclusions? Next, begin to craft your post. Figure out what you can do to one-up the competition on every point. Take their data and find a better source with more data, or harvest more recent data yourself. Analyze their conclusions and draw your own. Do what they do, but better than they do it. Don’t worry too much about word count as you write. Chances are, the competition will already been quite lengthy, and you can borrow their structure and flow to form your own post of similar or longer length. Write as much as you need to in order to cover the subject completely. Then go back over it and pare it down, edit out parts you don’t need, parts that don’t flow, or parts that just don’t matter. Only then can you consider yourself the author of a high quality blog post. Is it Better to Post Fewer Long Articles or More Short Articles?